“Minutes of a meeting held 16 May 1877 in the Orderly Room [of the Armed Constabulary redoubt] at Cambridge for the purpose of forming a band. Fourteen gentlemen were present. By the end of May 1877, thirty-four more members had joined. The first request for their services was from the Episcopalian Church [Church of England] and eighteen members played at their concert. 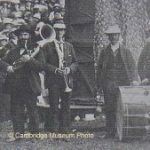 By the end of the year they had played at the local cattle show, accompanied the Cambridge Cavalry Volunteers to a review at Ohaupo, played in Hamilton and at a concert and dance in the Public Hall. At the beginning of 1878 they elected a Managing Committee and prepared a Code of Rules. Major Clare was their first President and Colonel Lyon their first Patron. By the end of 1887 the band had split in two and there are no more minutes in the book.